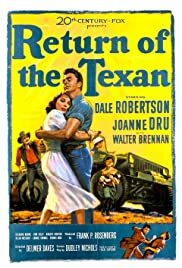 During the 1950s, after many years in Kansas City, widower Sam Crockett, his 2 children and his grandpa return to their abandoned family farm in Texas and face many difficulties. Forced by circumstances,Confederate POWs and Union soldiers join forces against Indians but old animosities resurface during their fragile alliance. A former bank robber searches for his double crossing partner who left him for dead, while having to look after a 6 year old girl. A "modern" western by a specialist of the genre,"return of the Texan" is an endearing film,if only for its simplicity and for Dudley Nichols's interesting script.The writer walks a fine line between drama and a happy-go-lucky attitude,epitomized by the rather dull hero (the Texan who returns home after his wife's death in the city) and his reckless grandpa ,roguishly portrayed by Walter Brennan.The generation gap in reverse.Besides ,every time the plot seems to turn tragic (shots in the woods,the old man's stroke,the threat of seizure -the banker's letter is not what we expect-),dramatic impact is immediately defused.The rivalry between the hick and the doctor always remains friendly,never the two men show any animosity or hard feelings.The villain,Richard Boone,is the only real flaw of the story,the part being underwritten to a fault. The tragedy only happens at the very end ,but all in all ,it's not really one,after all,c'est la vie.The next to last scene is the best:Delmer Daves' s love for nature -which was radiant in "broken arrow"-shines as grandpa explains to his two little boys,Steve and "Yo-Yo" how precious life is.